Aluminum parts on this PES4 shut off reduces tool weight for easier handling. Also works for metric pipe, with optional stops. Reed offers a wide variety of optional stops for all Reed PE Squeeze-Off tools. VIDEO DEMO OF THIS PE PIPE SHUT OFF SQUEEZE IN ACTION! 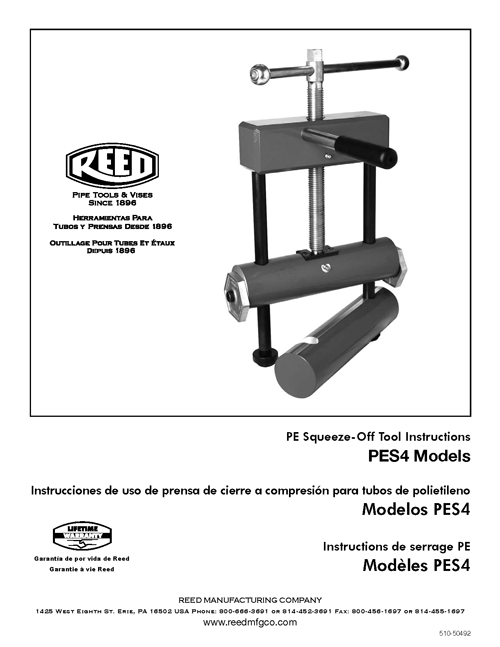 Reed offers the best designed tools for stopping flow in ½” up to 8” PE pipe. Sliding bar handles make work in tight places easier and increase leverage for tightening. Fine-pitched thread on feed screw allows for a controlled, low-effort squeeze. Grease fittings at friction points make operation smoother and extend tool life. Aluminum bars are anodized or painted for protection from the elements. All PE squeeze-off tools use positive stops to prevent damage caused by over-clamping. Multiple size/SDR settings on one pair of stops provide quick, convenient over-squeeze protection for standard pipe sizes. Click the button below to add the PE Pipe Shut Off Squeeze Tool 2" IPS x 4" IPS to your wish list.